How didn’t anyone think of it before? I have to build it! Fair enough but I’m sure you’ve heard that 99% of startups are doomed to fail and you want to be among the 1% champs. I’m also sure you’ve read the Lean Startup and all about MVP and getting your idea tested ASAP. That is important! Speed on testing and testing as much as possible is vital, but should you just build the first thing that pops into your mind? 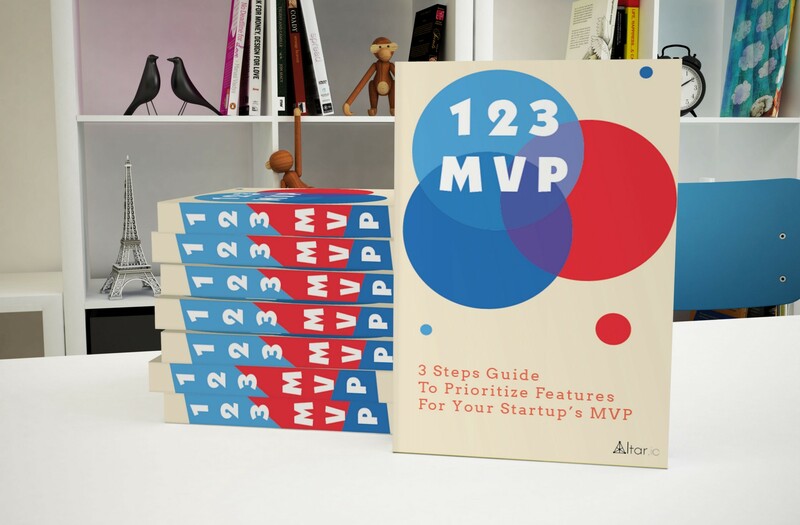 The process is called 123-MVP and we’ve used it with all the startups we worked with through Altar.io and 10kstartup, we also applied it to the +10 startups we built together in the past 6 years. Find a visual map in the end of article. While going through the 3 steps I’m taking AirBnb as an example, to make it more tangible and less theoretical. AirBnb is one of most used Startups to benchmark whatever. Sorry for using a common place, but this way I’m sure all of us know what we’re discussing about. What is the problem / pain you’re trying to solve? It’s been created for ____ (your stakeholders) who ____ (state their problem). ____ (name of your product) is a_____ (a statement of its key benefit / solution). Unlike ____ (current solution) we ____ (say what differentiates you from the alternatives/your existing competition). The final output must be a SSCC Elevator Pitch = Simple Stupid, Crystal Clear! If it is unclear, go back to step 1). Travellers around the world cannot find an easy way to book a room with a local or become a host. The main existing offer for tourism accommodation is an hotel, which is not adapted to the preferences of Millennials because it leaves them disconnected from the City and its culture. 2) What is your VP ? Airbnb is an online marketplace connecting travellers with local hosts. On one side users can list their available spaces to local tourism and make extra money while travellers can book unique places from locals, saving money and getting a chance to interact with them. 3) Who is the main target ? Traveller: person who enjoys travelling without spending the whole budget in an hotel room. He/She usually is a millennial, keen on learning from and co-living with different cultures and willing to enjoy experiences with locals rather than people from the home Country. Millennials tourism behaviour is quite interesting: 3/4 vacations p/year, they prefer experiences VS resorts, they save in accommodation and spend in activity. Host: owner / renter who is willing to rent out his space. The reason is usually making money accompanied with the interest to meet interesting people. 4) How does each target stakeholder deal with the problem today (Benchmark )? 5) Why are we better than the current solution? Airbnb is perfect for Millennials. It enables travellers to manage their trips accommodation in a natural, hassle-free and simple flux with the best value for money, taking into account their concerns for being more genuine and cost-efficient. It also enables owners to rent out their spaces in an easy way, by simply listing the place on the platform once and receiving money exclusively online and offers an affordable solution to the travellers. 6) What is your Elevator Pitch? It’s been created for millennials who want to travel in a comfortable, cost-efficient and genuine way. AirBnb is a marketplace to fill the gap between Hosts that want to short-rent their homes and Travellers that are willing to pay to be hosted in private venues by locals. Unlike Hotels, Airbnb creates engagement between guests, hosts and their cultures and simplifies the entire process of renting a space around the world. Unlike Hostels and Couchsurfing, Airbnb is more exclusive and suitable for a more private and comfortable stay. What are the main assumptions from your Elevator Pitch? What are the relevant assumptions required for the product to be meaningful? We should in this step decompose all the relevant statements from the VP / Elevator Pitch. From these assumptions which are already validated? Part of the listed assumptions can be validated with research; research is much more accessible than product testing. From these assumptions, which ones do we need to validate and which are the KPIs? From the assumptions that are not proved and need to be tested, what are the metrics to measure them. 1) What are the main assumptions from your Elevator Pitch? 2) From these assumptions, which ones have been already validated? 3) From these assumptions, which ones do we need to validate and which are the KPIs? Is it possible to do an MVP that is faster than an application to implement and that is enough to test my main assumptions? See this article: The Early Stage Dilemma: Functional or Non-functional MVP ? After the first consideration 1), assuming you considered a non-functional MVP is not a good approach to test your market, then you are ready for the process of picking the features to develop. Is it mandatory to prove any of the main assumptions? If yes, keep it, if no, trash it. Remember a big ratio of entrepreneurs lose their way in this path because they don’t focus on relevant features to test the market. Considering we already have the main assumptions to validate with the MVP and we also know how we are going to measure them, we are then good to know where we must focus to craft our MVP. Picking the right features is a battle between your emotional fetishist mind (This is essential = “oh I love this feature, please don’t take it away from me! Noooo, it is my precious!”) and your analytical mind (“I can’t do them all, let me focus in what is relevant to prove the main assumptions”). Is it possible to do an MVP that is faster than an application to implement and that is enough to test my Main assumptions? Video option, AirBnb MVP alike platform means a 3.5 months 35K USD implementation and the real metrics are much more valuable to prove my assumptions. Even if we could build the non-functional MVP and gather interesting metrics about the appetite of leads, it would not be gathering indicators of retention, just early adoption. What is your VP ? How does each target stakeholder deal with the problem today (Benchmark)? Why are we better than the current solution? What are the relevant assumptions from your Elevator Pitch? From these assumptions, which ones have been already validated? Is it possible to do an MVP that is faster than an application to implement and that is enough to test my Main assumptions? if yes, which is it ? Speed on testing and testing as much as possible is vital, but should you just build the first thing that pops into your mind?